So let’s get right to it – Yes. Ask around, and you’ll get a lot of info about the ‘Lady of the Lake’, as she’s known. You’ll hear how she had a ground accident sometime in 1955 – a gear collapse – and towing her clear of the runway did irreparable damage. Then she was cannibalised for useful parts, before being written off and towed into the lake. For several more years, she was used for underwater egress training before being left there. Trouble is, almost none of that is true. She is known as ‘Lady of the Lake’, but that’s about it. The water’s not even a natural lake; it’s a flooded gravel pit. What is known – but only since an exploratory dive in August 2014 – is that the wreck is a WB-29A, serial 44-62214. The proof came from the radio operator’s fold-up table which, after careful washing, revealed the names of several regular crew and the plane’s serial number written in white grease pencil. If nothing else, it ended the rumours of the aircraft being damaged by a gear collapse. 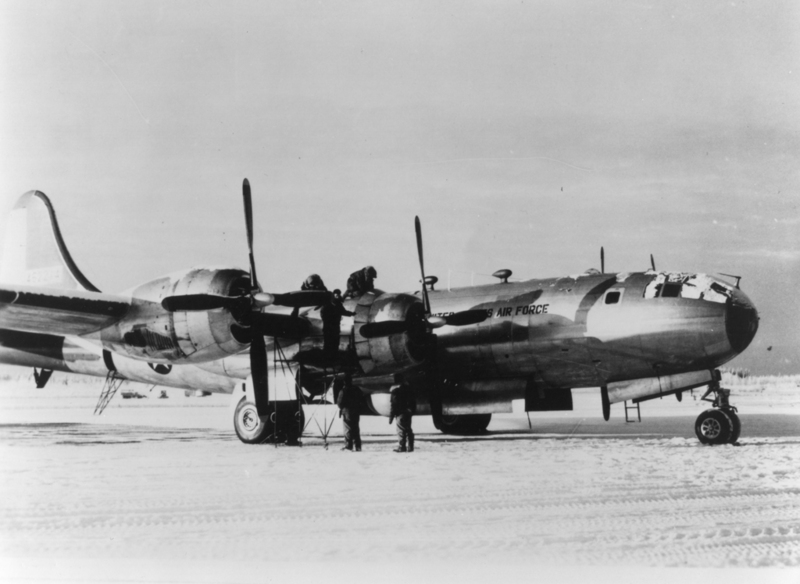 That story more likely concerns 44-83905 a KB-29P (the final B-29 tanker variant) which landed at Eielson on April 17th, 1956. The nose gear collapsed during her rollout and she ended up in a snowdrift. But a tanker on a mission was obviously needed by someone, somewhere and, a full decade after WW2, parts for ageing B-29s were in short supply. As Eielson’s 58th Weather Reconnaissance Squadron had almost fully converted to newer WB-50Ds by mid-1956, a nose leg could have been scavenged off of #214 to get the KB-29 back on its way. The other part of the enduring legend – that ‘The Lady’ was used for underwater egress training is also unlikely. Emergency training was a fundamental part of operations at Eielson. The crews were flying vast distances across polar tundra and oceans in ageing planes. 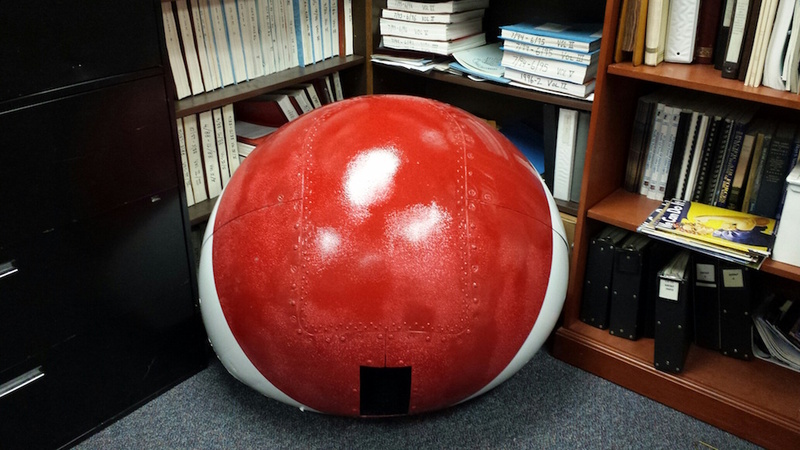 The WB-29 tails were painted bright red because it showed up well on ice, snow and the ocean. . . Enough said. There are unverified accounts of #214 being used for emergency extraction training – that is, rescue training for Eielson’s fire crews – while the water was still shallow. These exercises supposedly stopped when the gravel pit flooded. Despite the near-zero visibility 60 years later, the divers could feel evidence of entry damage to the fuselage, which would be consistent with this kind of activity. The bottom line is that no-one knows exactly when, how or why 44-62214 was moved to a gravel pit and left there. But Jack Waid, Historian for Eielson’s current residents, the 354th Fighter Wing, is keen to find out more. One indisputable fact is that 44-62214 was facing her end, one way or another, by the mid-1950s. While the 58th kept up a formidable record of mission readiness with their ten weary aircraft, Jack Waid has a report from the end of 1954 which recounts ongoing maintenance difficulties. The nearest source of B-29 parts was Elmendorf AFB near Anchorage, 250 miles away. Then Elmendorf ceased acting as a supply depot, so everything had to be requisitioned from bases in the lower 48. Further to that, the squadron was slated to start receiving the stronger and more powerful WB-50 Superfortress from 1955. A crew was sent south to Riverside, CA at the start of the year to learn the new aircraft, before returning to pass their knowledge on to the rest of the squadron. 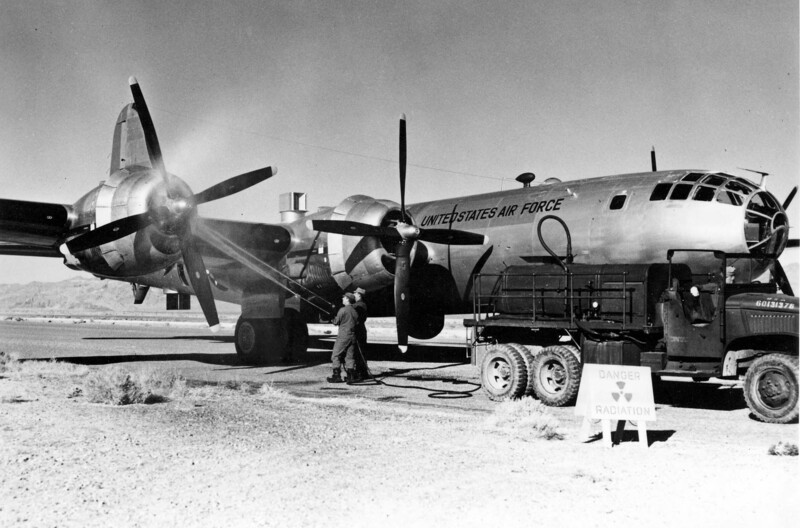 They arrived with the first example – a TB-50 (#46-032) for transition training – in mid-1955. This training continued for the next 12 months, alongside the daily WB-29 missions. The first WB-50D mission didn’t launch until June 1956 – flown by the ill-fated ‘The Golden Heart’ (#49-315, named for the City of Fairbanks), which would crash on August 31st, tragically killing all 11 crewmen on board. 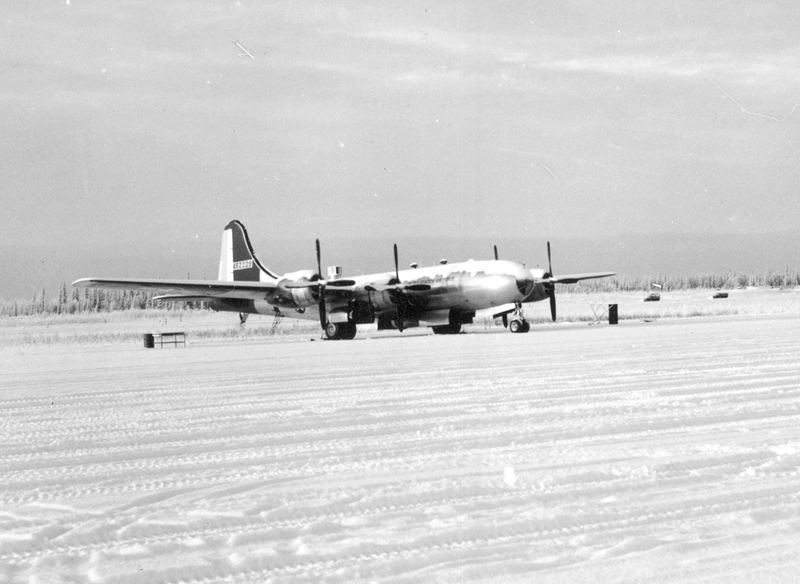 A WB-50 with the 58th WRS at Eielson, sometime between 1956 and the squadron’s inactivation in August 1958. This looks like 49-0325, originally a B-50D-115-BO (msn 16101). Even then, the WB-50s were no spring chickens. Most WB-50D conversions were 1949-vintage Superfortresses, from Boeing’s 49-326 to 49-358 (msn 16103 to 16134) contract for B-50D-120-BO aircraft. Given the age of these “new” planes, the squadron’s tired and patched WB-29s must have all looked like creaking antiques. The final WB-29 mission was flown in late September 1956, and the 58th became an all-WB-50D unit from there. So where was 44-62214 during this conversion phase? 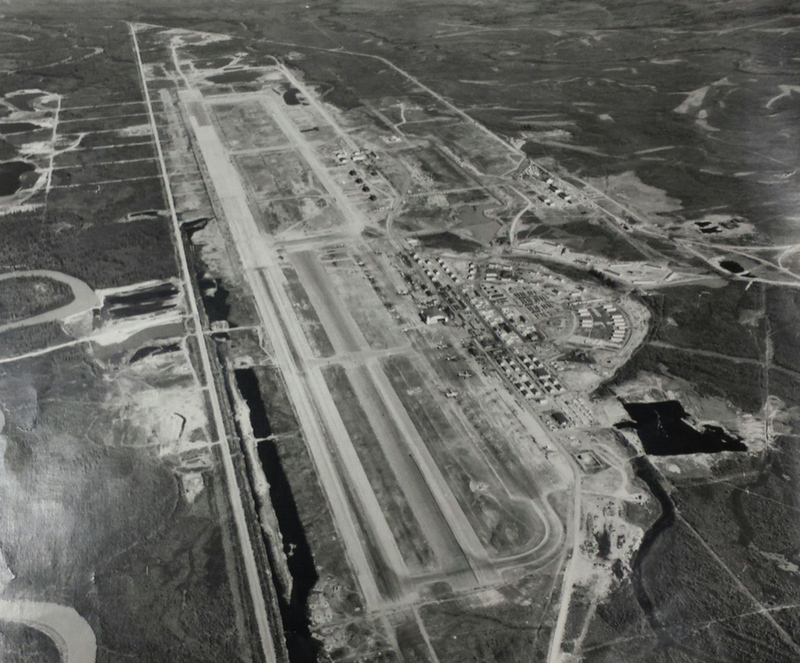 According to Waid’s report, Eielson’s extended supply lines caused no end of problems, with a series of aircraft spending long periods AOCP (Aircraft Out of Commission for – i.e. awaiting – Parts). For example, aircraft 42-62197 was AOCP from July 1st, 1954 for want of an Oil Cell Assembly. While waiting for this part, the aircraft was repeatedly cannibalised to keep other WB-29s flying. At the end of August, it was still AOCP for something as mundane as 12 screws, but by the time those arrived the aircraft had been cannibalised again. It would only come back into commission on October 16th. The same report mentions 44-62214 specifically. Our aircraft was AOCP for 17 feet of wire rope during August, and the inevitable cannibalisation began. Briefly back on the line in September, she apparently flew her last ever mission on September 16th, 1954 (a ‘Loon Echo’, with Capt. CT Gustafson commanding), then was AOCP again from September 24th and declared ‘PE’, or permanently off the inventory for fair wear and tear, on November 15th. No doubt the PE status was driven by the intensity of her interim role as parts source. The aircraft’s last Crew Chief was almost certainly Conrad Layton, who now runs reunions and this website for 55th and 58th Weather Recon Squadron veterans. He was stationed at Eielson from December 1953 until November 1955 and questions the official record. By his recollection, #214 was no ‘Hangar Queen’. However the Crew Chief’s definition of a Hangar Queen is a plane with constant snags (the other term is “dog”), not one that’s simply idle for a lack of parts. 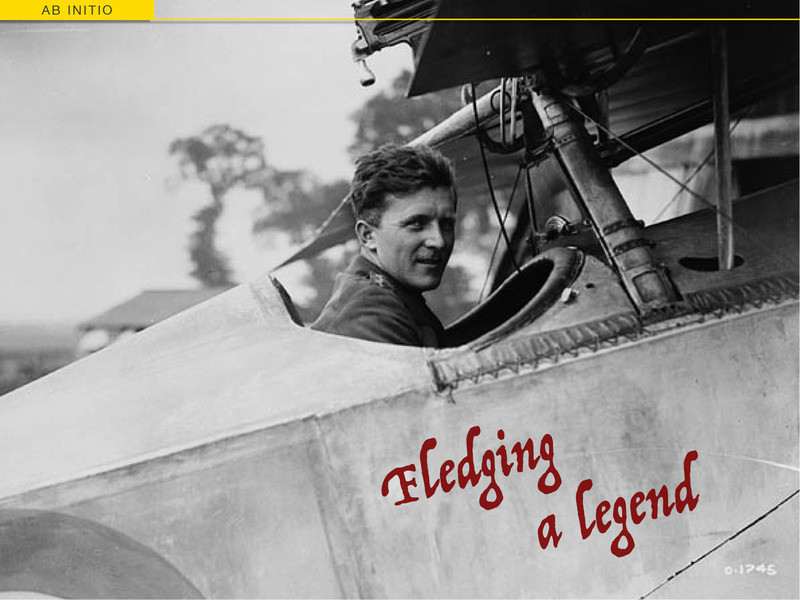 Layton remembers WB-29 #300 (the full serial isn’t clear) as the real Hangar Queen and, intriguingly, recalls an incident where its wingtip was damaged in a ground accident. He goes on to describe the plane being heavily cannibalised for parts but finally being returned to the air. It doesn’t quite align with his recollections, but I can’t help wonder whether #214 provided the replacement wingtip when it was eventually needed. The ‘Lady of the Lake’ is missing her right wingtip; and information at the site (sourced from the Air Force Historical Research Center, Maxwell AFB, in 1976) says Records show that the aircraft was dropped from the Air Force inventory in 1955 because of a ground accident, but no record of a ground accident can be found for “214”. No-one ever said that accident happened to 44-62214. 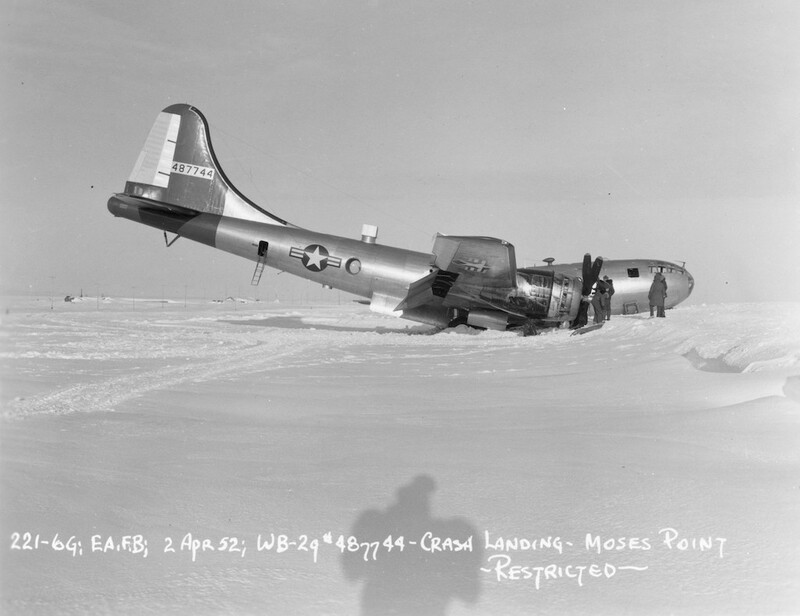 Meanwhile, Layton was in that group that went south for B-50 training in the winter of 54/55 – about the time #214 was taken off the inventory – and was Crew Chief for the TB-50 from the time they returned to Eielson until he rotated out in November. He says he has a photo of the Eielson Maintenance Board from the period, showing all of the 58th’s active and inactive aircraft. It includes the TB-50 but not #214, which makes perfect sense – if she was off the inventory, she’d be off the Maintenance Board too. Still, Conrad Layton is sure the records are FUBAR somehow – be it through clerical error, confusion, or deliberate obfuscation. Obfuscation? On an Air Force record? Well, as Layton points out, a lot of 1950s officers were schooled on Pacific bases during World War 2. They knew how to get what they needed and how to make problems disappear. Added to that, many of the missions out of Eielson included covert activities, so full and complete records weren’t always the order of the day. Which seems to open up another possibility. . . Under the cover of their ‘weather reconnaissance’ the WB-29s of the 58th were charged with collecting air samples to detect Soviet nuclear tests. This duty was highly classified, and accomplished with considerable distinction by Eielson’s crews. And Layton has a story which mightn’t have made the official records. It came from a vet who’d served at Eielson in 1956. He recalled one WB-29 coming back so ‘hot’ with radioactive contamination that it was towed to the gravel pit, stripped of parts, and left. The air sampling WB-29’s often came back ‘hot’; their job was to fly through Russian fallout, after all. Normally when it happened, the crew’s gear and parachutes would be burned and the aircraft thoroughly washed down until it was safe to use again. A second veteran, who doesn’t know the first, then corroborated the story. He recalled helping to drag a contaminated plane to a gravel pit just before he rotated back to the lower 48. He also said he went back into the aircraft and removed a couple of cargo straps to tie down his load for the long drive south. At the next annual reunion he handed the straps to Layton, who still has them.. The gravel pit in question is a full mile from the end of Eielson’s current runway – the kind of distance you might drag a ‘hot’ ship (there are plenty of other lakes closer to the runway), but perhaps not the first place a departing airman would look for luggage tie-downs. Trouble is, not even the B-29s that flew through fresh fallout after America’s Nevada and Bikini Atoll tests were treated so ignominiously. They were washed down and returned to service. And besides, why would the Air Force salvage ‘hot’ parts out of an airframe that was too dangerous to keep? And who’d want to go back into a plane which was that radioactive, let alone take its cargo straps home with them? So much for clear memories. History is full of amazing stories and well-documented coincidences. There’s just no record of anything so interesting happening to 44-62214, which means the other great lesson of history probably applies – that the most mundane story is also the most likely. That would be the official USAF record, where 44-62214 was cannibalised while AOCP at the end of 1954. With winter, supply problems and the conversion to WB-50s all on the horizon, she was then written off and picked clean in order to keep the younger WB-29s flying. 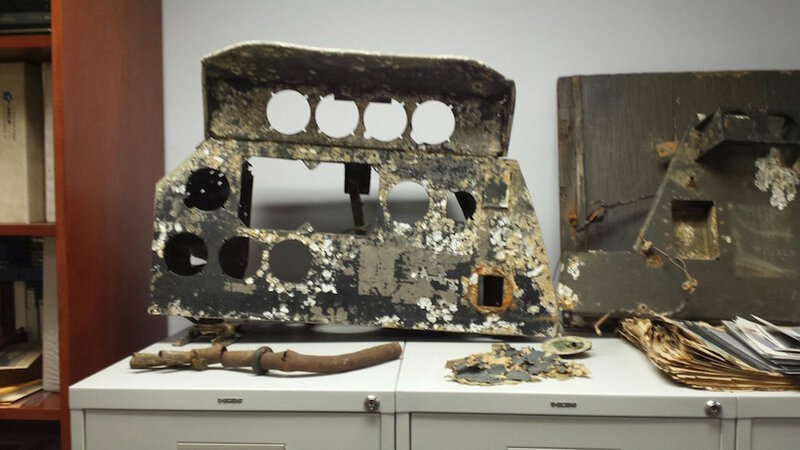 One of the artefacts recovered by Jack Waid’s divers in 2014 was the co-pilot’s panel, which is as empty as the day Boeing workers drilled it out at Renton. That alone would point to a systematic parts recovery, rather than the hasty dumping of a ‘hot’ ship. Sometime in the summer of 1955, the old war-horse would have been moved to somewhere emergency crews could use her for their extraction training. With a railway on one side and a gravel pit on the other, Transmitter Road would have been ideal. When rains flooded the pit that fall, the training must have become too dangerous (and cold! ), so the wreck was simply left in the water. Jack Waid found one other record, from 1962, which references “a B-29 located at approximately one-mile Transmitter Road” which was scheduled to be picked up and sold by the 5010th Redistribution and Marketing Division – part of Eielson’s host unit, the 5010th Combat Support Group. However the records don’t refer to the sale again, or the B-29 in question ever being moved. Waid has plans to explore 44-62214 much more thoroughly this spring. His team will drain the lake in order to make a detailed investigation and gather new clues about 214’s story. Does she have all three gear legs, for example? Is the missing wingtip on the bottom of the lake, or absent? And what else is down there. . . ? But for now, let’s get back to the original question: ‘Wow! Does it have a war history? Did young men die here to win victory in 1945? The ‘Lady Of The Lake’ certainly does have a war history, but not from World War Two. In fact, she’s one of the USAF’s most significant Cold War relics. But to get to that, we need to rewind a bit. She was taken onto the USAAF’s books on September 5th, 1945, and delivered to Chico, CA for fitting out. From there, she appears to have been assigned to the newly-redesignated 308th Reconnaissance Group, Weather – part of the Air Weather Service, under the auspices of the Air Transport Command / Military Air Transport Services. I’ll spare you the even more bewildering sequence of designation and name changes that the 375th went through. 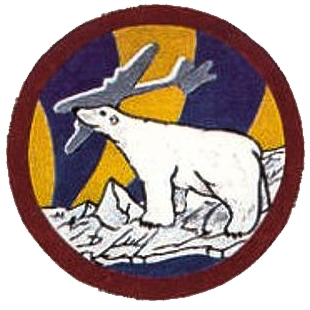 Suffice to say, they arrived at Eielson on March 5th, 1949; then became part of the 58th Strategic Weather Squadron from February 21st, 1951, under the auspices of Strategic Air Command. The squadron soon took on the name ‘The Pole Vaulters’ for their frequent flights over the North Pole. They flew ultra long-range ‘Ptarmigan’ reconnaissance tracks over the Arctic Ocean and ‘Loon’ tracks over the Bering Sea, culminating in almost-daily ‘Loon Charlie’ flights between Eielson and Yokota, Japan. But there was more to the Loon Charlie flights than the Air Force let on. Along with their standard weather equipment, the aircraft had been fitted with air sampling scoops, known as ‘bug catchers’ by the crews. These scoops trapped particles from the passing air stream in paper or cloth filters, which were passed in for analysis at the end of each flight. What they were hoping to find was radioactive material – fallout from a Russian A-bomb test. Besides, the Soviets didn’t have ‘the bomb’ when the 375th went north, and some experts didn’t expect them to build one before the mid-50s. However, on September 3rd, 1949, First Lieutenant Robert C Johnson and his crew flew out of Misawa AFB, Japan (the alternate for Yokota) on a 13½-hour reverse Loon Charlie to Eielson. Back in Alaska, analysis of their bug catcher filters revealed elevated levels of radioactive material. The 375th had detected the Soviet Union’s first atom bomb test, code-named ‘Joe-1’ (after Stalin) by American intelligence, and Device 501 or ‘First Lightning’ by the Russians. * An intense series of subsequent missions confirmed the initial analysis and tracked the fallout as it circled the globe. The discovery came as a surprise to the West, but the prompt detection came as a deeper shock to Stalin. And the aircraft which made that critical flight – was #44-62214. Incidentally, Lieutenant Johnson had had a shocking mission. He was meant to leave Yokota on August 30th, but an engine failed during his B-29’s run-up and the 11-man crew had to transfer to the reserve aircraft. This brought their take-off time uncomfortably close to the arrival of an approaching typhoon. Then, about an hour into a doubtlessly rough departure, the reserve’s No.3 engine burst into flames. By now, Yokota was closed due to the storm and Johnson was told to divert to Misawa, 350 miles away. 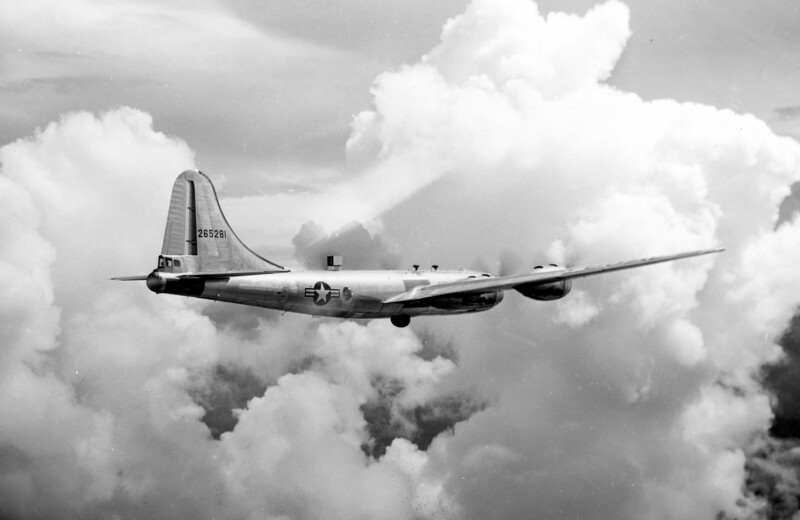 Flying the heavy, three-engined B-29 over built up Japan, in bad weather, and unable to dump fuel on the populace below, Johnson was dangerously close to stalling for the rest of the flight. When he did land at Misawa, the hour-plus of red-line operation meant all four engines had to be changed. In stark contrast, 44-62214 flew a flawless Loon Charlie into MIsawa on 1 September. Then, because of the quadruple engine change being performed on his plane, Johnson took the turned-around #214 for his fateful return trip of the 3rd.5. That long chain of events makes the ‘Lady of the Lake’ an extremely significant piece of history. As much as the Berlin Airlift brought the Cold War into the headlines, the detection of Joe-1 brought it into everyday life. The nuclear arms race had begun. For this alone, 44-62214 is worthy of place in the Smithsonian Institution or the National Museum of the USAF at Wright-Patt. Then again, she also belongs in Alaska, as a memorial to the men who stood and served through years of ice and snow and mosquitoes – and the dangerous watch they kept. Whether or not she belongs in a lake, I couldn’t say. 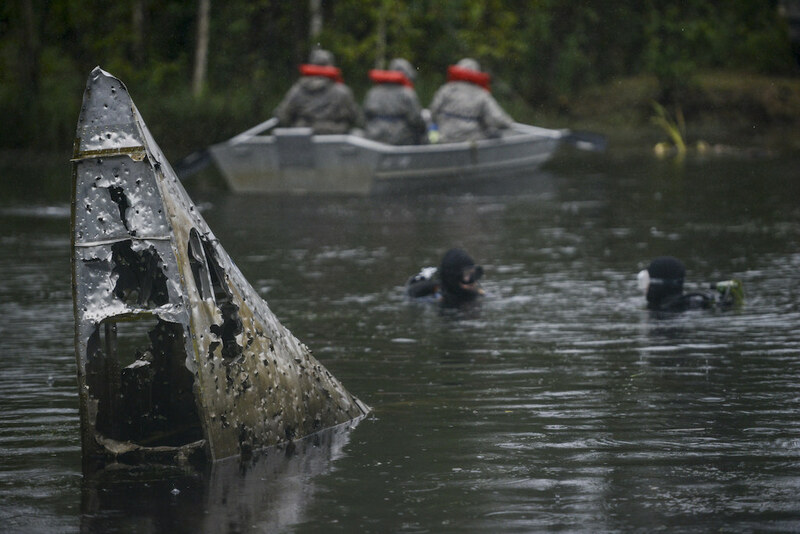 The cold, still water is a superb preservative, and any attempts to remove the fragile weather reconnaissance bomber could open a multi-million dollar can of worms. The questions about #214’s future may be just as hard to answer as those about her past. But either way, I’d respectfully suggest the 5010th Combat Support Wing’s official description of their ‘Lady of the Lake’ as “just a worn out B-29” could use a little updating. This article wouldn’t have been half as good without the co-operation of Jack Waid, GS-11, 354 FW/HO (Historian), Eielson AFB, AK. I’m also indebted to Conrad Layton’s 55th and 58th WRS USAF site and the Air Weather Reconnaissance Association website. 1. Conrad Layton’s 55th and 58th WRS USAF site. 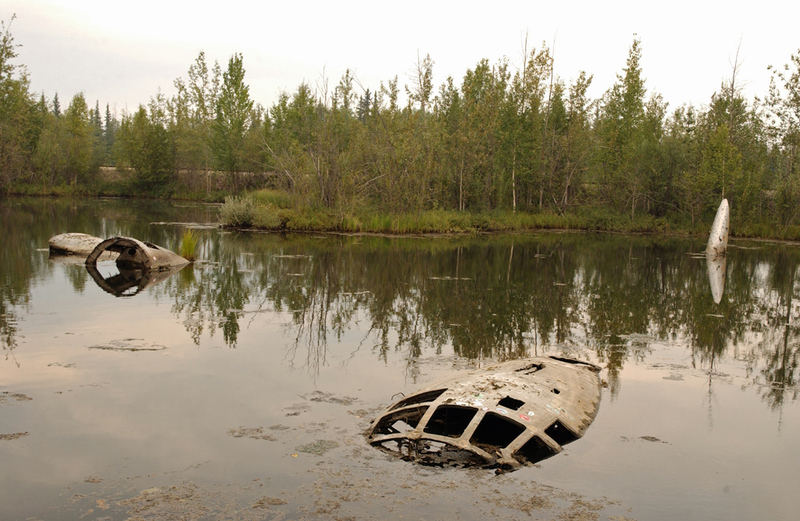 It’s sad to see such a rare and historic airplane rotting away at the bottom of a flooded gravel pit. It’s not surprising though. I used to live in Alaska, and there’s no shortage of bent, broken, and buried airplanes throughout the state. Still, a B-29 — that’s pretty rare. If they could rescue Glacier Girl from beneath 268 feet of Greenland ice, I’m sure they could rebuild A Real Lady too. Compliments on another riveting (no pun intended) post. Thanks for a great reply. There’s no doubt the Lady Of The Lake is a sad (if evocative) sight, but being dumped in a gravel pit was also her salvation. We could have been drinking soda out of her recycled remains years ago. And you’re right, a full restoration is just a matter of finding the will and getting the money. On the other hand, we’re talking about a king’s ransom in both: Remember, Glacier Girl was one of six P-38s plus two B-17s. 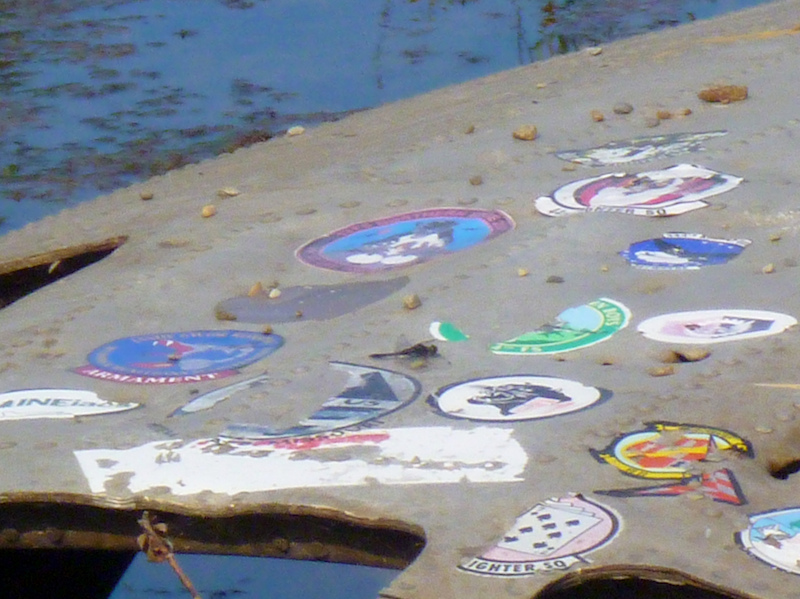 The rest are all still in the ice. So at this stage, confirming the history and spreading the story is most important for #214. Hopefully that will generate the will power and wallet-opening for a careful, diligent and properly resourced restoration. I’d never heard of Kee Bird, but I found a video on YouTube, as well as a Google Earth photo of what it looks like today. That really is sad. They were literally about to fly the darn thing. I’d love to see a post about that airplane. These aircraft seem to have a will to live. Kee Bird was predicted to sink to the bottom of the lake when the ice thawed in ’95, but here we are 20 years later, and it’s still there. What a fascinating post. To see any aircraft resting a in a lake/pit is sad, but the mystery behind her adds a little something to her. Like many tales and old folk law it keeps her alive and more importantly, people interested. You raise an interesting point. In the normal course of events, this aircraft would have been flown south to Tinker AFB; thence to Davis-Monthan, parked for a couple of decades, and cut into frying pans. Being dragged into a hole a mile from anyone has saved (sort of) a significant piece of Cold War history. It’s a similar story for every Spitfire, Hurricane, and countless other warbirds flying today. And that’s the real problem: The world seems to be a lot better at recovering and restoring old aeroplanes than preserving them in the first place. Defiantly! A little more foresight all those years ago would have saved a lot more and a wider range of examples. Whilst I love the sight and sound of a Spitfire etc, there are a large number of them about. Other models are few and very far between, many permanently gone! Yes, the stars get saved but many others are gone forever. People have scratch-built WW1 types, Mosquitoes and even (I believe) a P-51, so the sounds and shapes can come back. But aircraft that carry a physical connection to history are irreplaceable. It is amazing to think about how many airplanes were built during the war and how few are left flying. Sure, the people who designed them didn’t mean for them to stay airworthy for a hundred years… but then, they also couldn’t have imagined the time, money, and love people would pour into that task. I think many folks assume war losses consumed most of the fleet, but the sad reality is that most of them survived the war and were destroyed on purpose since there was no “need” for them anymore. Sort of an I’ve-met-the-enemy-and-he-is-us kind of thing. Imagine you work in a liquor store and one night someone points a shotgun in your face. You keep it together: maybe they get all the money; maybe you hit the alarm and they run off. Anyway, you’re okay. But would you really want to keep some memorabilia? The crime scene photos? The shotgun once the police recover it? Years later, your big night might become a family legend. You’d probably feel proud that you didn’t mess yourself and your grandkids might think you’re a hero. And here’s the thing: They’d all wonder how, or even if, they would have handled themselves. THEY’d want the shotgun, or the Civil War sword, or the Mustang.. I just re-read Bud Anderson’s “To Fly & Fight”. In my edition’s afterword, he catches up with Otto Heino who was his crew chief right from the start, responsible for hundreds of flights without a single abort. When Anderson rotated back to the US in January 1945, Heino volunteered to be a gunner in B-17s. He jumped from a stricken bomber on the runway, just before it ran off the end and exploded with the rest of the crew still aboard. He was shot down over Germany and made his way back to the Allied side. And after the war, he never looked at another airplane or engine, but became a world renowned potter. He never even went to a reunion. For almost 50 years, Anderson had thought he was dead. I guess he’d seen enough. What makes less sense (see, I am going somewhere with this) is the spectacle of the world’s Air Forces and Navies going to unlimited effort to recover wrecks that will complete their museums’ collections. From icy tundra, to tropical jungles to the bottom of Lake Michigan… they should have done better. On the other hand, I think they’ve learned the lesson, and are (hopefully) better at preserving examples of their inventory now – both for themselves and for other carefully selected and distributed aviation museums. But, most importantly, for those who served and those who respect that service. Thank You for the post, I was just reading about another set of airplanes of the cost of Australia. These seem like pretty interesting items to see! Do you know if there is a website, or larger list of WWII planes that are under water, or still in the same place since the war? Thanks for your comment. Saving the stars is definitely better than nothing, and of course it’s unrealistic to save them all – so choices have to be made. However I still think an ounce of preservation is worth a pound of restoration! As far as underwater relics goes, you really can’t go past Pacific Wrecks (http://www.pacificwrecks.com) for this part of the world, but I don’t know of anything comparable for other major WW2 theatres.